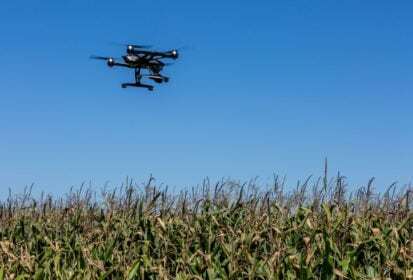 Southwestern Ontario crop input retailer and grain handler South West Ag Partners has made a deal to sell its precision agriculture analytics business to an expansion-minded drone data provider. Toronto-based Deveron UAS announced Aug. 28 it will trade a 9.9 per cent share of its business plus $320,000 cash for South West Ag’s Veritas Farm Management arm. Veritas offers precision ag analytics and farm business consulting services to farm and retail customers in southwestern Ontario. Deveron’s business plan is for the development of a standardized network of pilots, drones and sensors to provide “ultra-high-resolution” data for North American farm operators. “Veritas has built an insights business deeply rooted in understanding the needs of farmers and what can be implemented on the farm today,” Deveron CEO David MacMillan said in a release. “Drone imagery has become one of the tools that allows for better management decisions,” Veritas business manager Aaron Breimer said in the same release. South West Ag — which operates grain handling facilities and processes food-grade soybeans for export — is also in the midst of a deal, announced in March, which will see its joint-venture co-owner Cargill sell its stake in the Chatham-based company to Quebec’s La Coop federee.